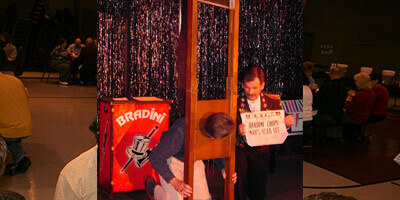 Enhance your event with Bradini’s 40-90 minute presentation of magic, comedy, audience participation, spectacular illusions, live animals, 1-3 assistants, curtains, sound system, music, and lights that is guaranteed to make your event a success. Corporate magic with clean comedy you’ll love. A completely unique interactive game show based on the popular show, Survivor and the 1960’s hit, Gilligan’s Island. Contestants go through various immunity challenges while the audience gets involved and votes someone off from each round until we determine the ultimate survivor. Enjoy walk-around close up magic designed to entertain your guests up-close and help them relax and enjoy the evening or party. 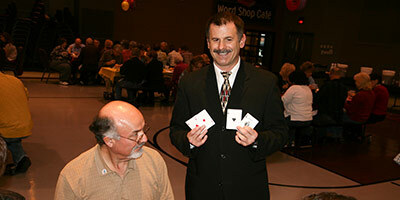 A great way to begin your evening with a professional magician who knows how to entertain your group. 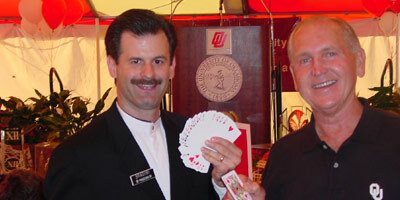 Designed to generate more traffic, leads, and sales at your trade shows (as a trade show magician or corporate magician Oklahoma). Also great for hospitality suites and adding excitement to your event. 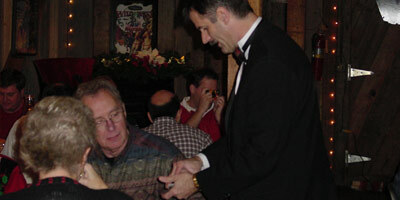 For the holiday season, add some special costume characters or even Santa to an outstanding magic show. Bradini has just the right program for your special event. Enjoy “Santa-via-Satellite”, where Bradini talks to Santa via satellite throughout the show and then magically makes him appear at your Christmas party or holiday party. When you want educational and entertaining programs to get kids excited about reading, engage Bradini’s Magic of Reading program. An Animated Talking Robot Piano Player that plays over 400 songs will add fun to your next event. Lots of costumes and music are available for your event. KC the Robot is great in a trade show booth, display, exhibit or promotion. Bradini can provide a variety of activities for your summer picnics, including Magic, Survivor Family Game Show, FunAir Face Painting, Balloon Animals, Clowns, Games, Prizes, Strolling Entertainment, KC the Animated Entertainer Talking Robot Piano Player, etc. Call to schedule your picnic. The ultimate in face painting with state-of-the-art technology. Uses low-pressure airbrushes, stencils, non-toxic, hypo-allergenic make-up. The kids love it and so do the adults!